Student budgets can only include costs of attendance for the individual student. Additional living allowances for married students or students with children are not included. A standard child care allowance, however, may be included — depending on the ages of the student’s children. Pharmacy students pay block fees. Enrollment in 12 or more credit hours per semester requires block fees. Payments are made in full at the beginning of each semester. Tuition and fees are a fixed amount each year. Costs are determined by averaging the total cost of books and supplies for a four-year accounting curriculum at the Campus Shop and Bookstore (with 25% of books purchased used at 75% of new book price, and assuming resale of 50% of texts at 50% of cost). Computer costs built into student budgets are “annualized.” This means the figure is derived from one year’s monthly costs for purchase or lease of equipment (including printer) and annual software purchases/upgrades. These costs are figured over a four-year period. Housing costs for students living on campus reflect the average of the following costs: average on-campus, air-conditioned double rooms with refrigerator and utilities and the average of rates quoted by local apartments with allowances for utilities. 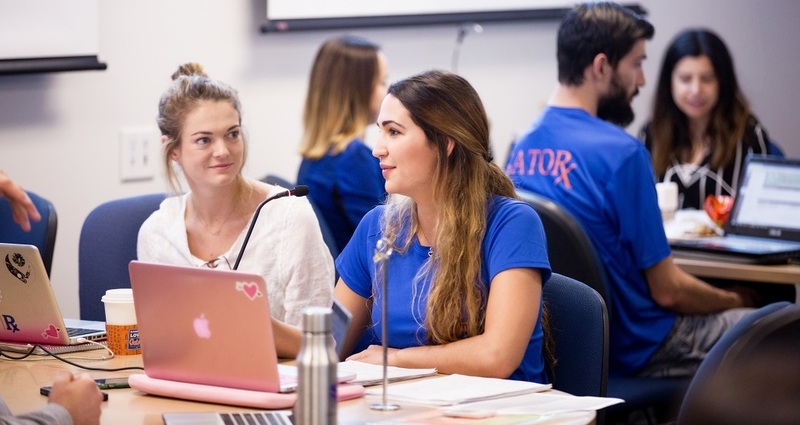 On-campus graduates costs are based on an average of rents for available UF graduate housing.Off-campus costs are based on the biannual Law Student cost survey, completed in November of 2012. This includes rent and utilities for 10 months. Food costs are based on Gator Dining’s Open Access 7-Day Meal Plan for on- or off-campus students and/or the Commuter 60 Block meal plan for students living at home. On- and off-campus transportation costs allow for four round-trips to Miami by personal automobile per two semesters. The personal budget is based on the U.S. Department of Labor’s established personal costs for one person. This includes laundry, toiletries, and minor miscellaneous expenses. The budget for clothing maintenance is based on the U.S. Department of Labor’s established clothing maintenance costs for one person. * Tuition costs listed on this website do not reflect the UF College of Pharmacy’s block fee tuition structure.